Challenge: Specifically Calla Liles, all you can find! I did another along these lines tonight as my photo a day subject. My lovely wife brought ME flowers this time! I had my white background paper setup for something else and it's there, you just can't tell it in this photo. I was experimenting again with my off camera flash. I actually handheld the flash unit, trying different positions and angles until I came across something I thought worked pretty well. I like this one with its shadows and also the textures I can see in the new bloom. Taken with the Nikon D3 and my 105mm macro lens on a tripod with SB-600 flash. This is one more from my recent study of the Calla Lillies my wife brought me. Of course you can't see much of the dark background here either but it's there and I liked the feel of the final crop. The lighting was from a small pen light behind and shining up through the blossom. Thank you Duke for opening my eyes to something or someone new (to me) and exciting. I looked at her work and loved it all. She is obviously so very talented. I will be asking for her new book as a birthday gift so that I can see all of the images and not just the few select ones on her site. I can't wait. She inspired me so much I had to go give my lily another try. The poor things are now wilting pretty badly, turning brown around the edges, and basically losing the battle. They gave their all however and their life was definitely not in vain. As long as my hard drives and disk backups remain, so shall they. This first one was a tad different for me in that I altered the hue and coloration a little but all else, along with the second, normal colored shot, was basically the same setup as others recently shot...Nikon D3, 105mm macro lens, three external flashes this time. Oh... I like both of these. I might crop the one one the right so it goes more with the series you are creating. 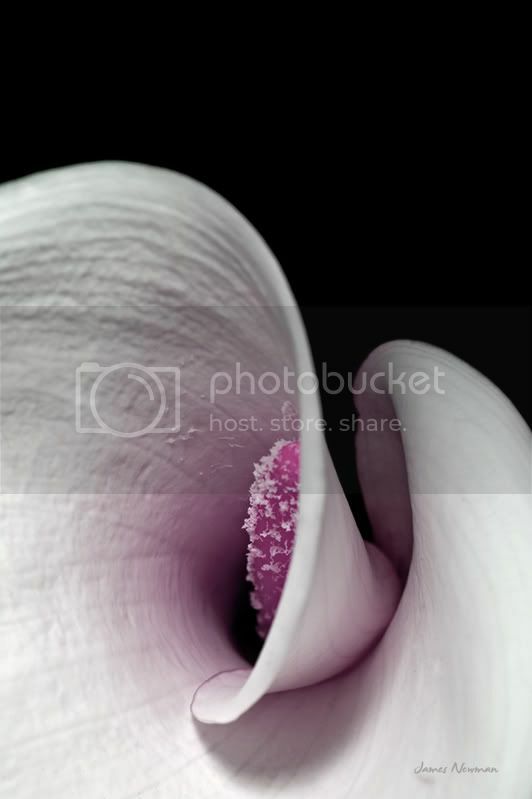 I like the Intimacy series better that the ones in Flower Portraits. But both books are good. Seems like the black background thing goes in and out of fashion. But I like them. 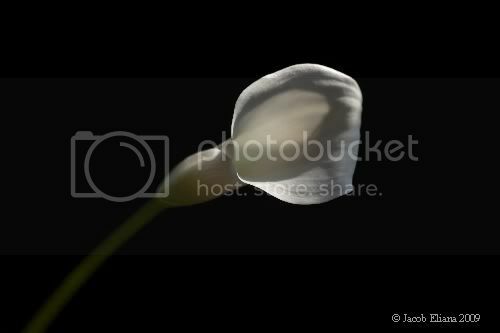 I've been shooting calla lilies, as has Janet Smith. In fact, it was her recent lily shots that got me to thinking about some I've done. Here is one I've been pondering. I like it but I've not yet made a decision about if it's any good or what it needs. ISO 100, f/4.0, 1/40. Rachel, I like this and, by coincidence, the asymmetry. what I would like is more green in the stem and perhaps more stem if you have it and a little more light on the flower. Asher, I wonder if I saw that and it unconsciously influenced how I shot this. I bet that's what happened. I've been making an effort recently to get more stem in my shots. I do have another view of that shot. ISO 100, 1/15, f/4.5. I selected the stem, boosted vibrance, sat, and brightness. Any better? The problem is that it's now too centered and if I add negative space, the stem will again seem too short. I think you have too much stem in this one. You need only enough stem to "complete" the lily, it need not dominate or over weigh it. I like the first lily in this thread more than either of the two following, but a little stem would help, I think. Glad I got you thinking about your Cala's again, they frustrate me enormously, so far I haven't managed to get a shot of them I'm entirely happy with. Out of the two you've posted I definitely prefer the one with more stem showing, for me part of the grace/elegance of these flowers is the stem, I have shot some very close in, focusing upon the curl/curve of the petal, but I prefer to show more of the stem (just my personal preference) but then I struggle with all the empty space around them. In the first shot you showed IMO it would be improved by losing some of the empty space above the flower. James Newman has also worked on them in this thread, you might find some inspiration there. You're right, Janet, James' post in that thread (#45) is especially stunning. I've always liked the one you posted here but now I'm wondering if a smaller aperture would make it even better, since you mentioned it. 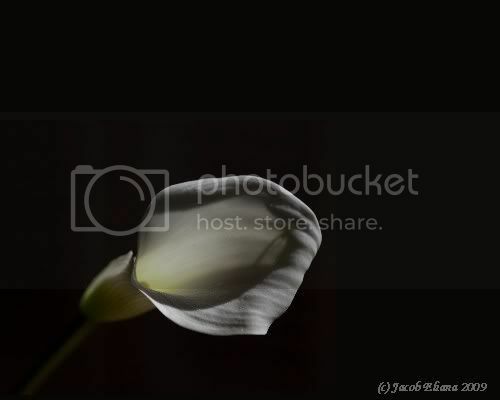 Elegant Calla Lillies: Add your favorites! 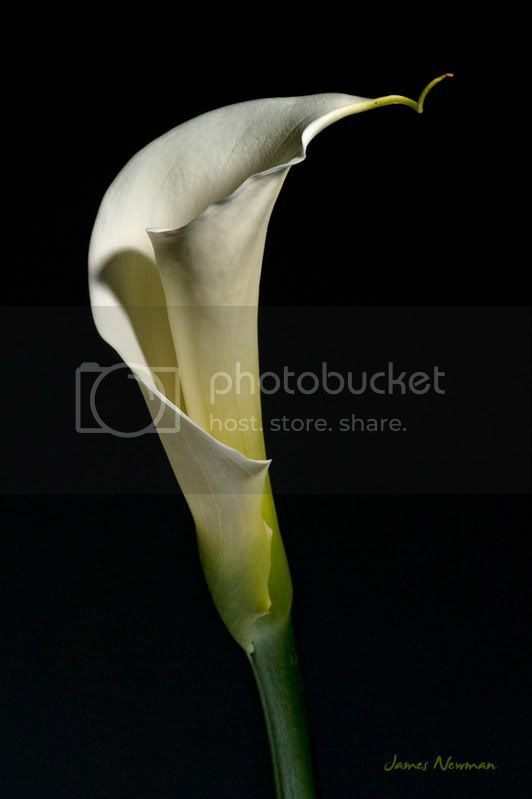 I have always been so fascinated by calla lillies. They come from deep green borad-leafed plants that grow up after the winter and present elegant ladies, like in a coming out ball. 3 years ago I posted this picture of a calla lilly with an interesting rim. The flowers are from my son's old apartment and I plan to search out this variety again this year. Maybe I'll even get a plant from the landlord! "I happened on this lilly as light as failing this evening. I returned to my 5D with the 50 1.2L Canon lens at f2.0, 1/60 sec, ISO 400." Well, since then, I have calla lillies in my garden but they have a simpler architecture. Then I was taken by the shape and B&W seemed appropriate, but today, it's the color that dominates. Two very different esthetics for the same species! I decided to frame just a portion of the flower. This is opposite to what I advocate of framing wide, but I just couldn't resist commitment, LOL! No corrections for natural dust and I decided to keep the aberration at the edges. However, I may crop of a little from the top before printing. This flower seems to have a flair of a Dervish "Whirler", the the white folds, spinning out. Sema, the Sufi form of dhikr, (remembrance of Allah), a ceremony not a "dance"
Lovely images of lovely flowers. Thanks for sharing them with us. 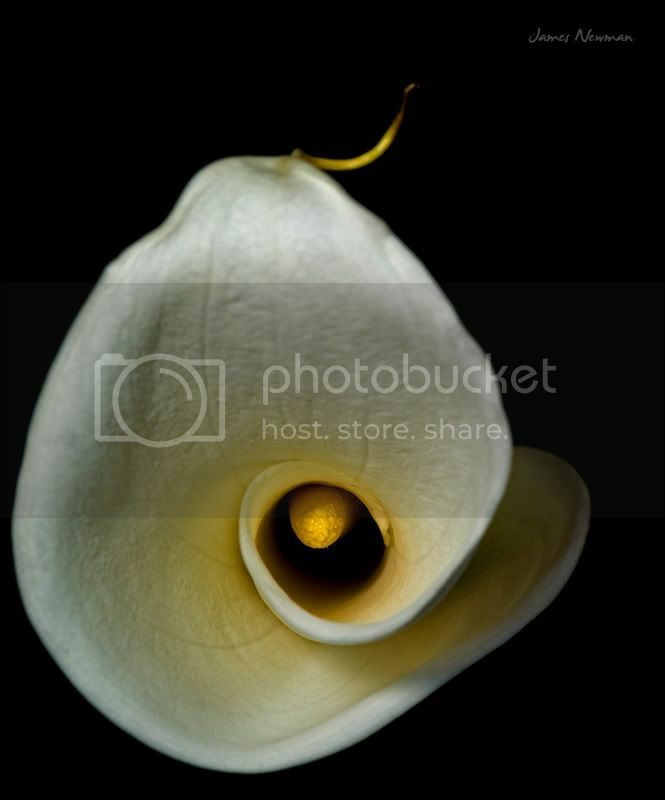 The "Calla" (not actually a lilly and, curiously, not a true Calla either) is Carla's signature flower; we call it (irrigorously, with a nod to common practice) the "Carla Lilly". Here's one from the flowers of 2010. ..and now they should be blooming again....go look in your gardens and pots! I took a bunch of Calla lilies home from a gala event and they are showing their age. Still, I've this flower and leaned one against a curved wall to catch the evening light. Please add your comments and your own examples to the collection! No such beauty blooming here. I love the example just before. tinged with raindrops; I remember it well from previously and this one is quite different but again, still so elegant. Thanks for visiting! 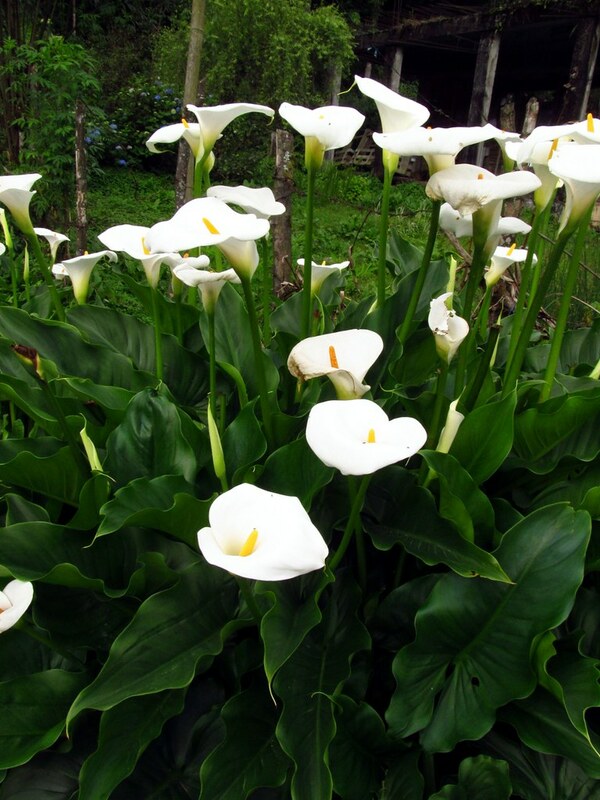 Yes, each type of Cala lilly has its own nature,. I like the one's from post # 7. They were in my on's apartment front garden, but then he moved and the fools dug them all out! funny that I wanted to "take" a piece of the bulb system but by the time my conscience allowed me to make an attempt, they were all history! You have a wonderful shot of that Calla Lilly #1 too. I have had a little go at showing you what I mean with my crop. I now feel there is more emphasis on that beautiful and bold stamen, as well as those fine striations in the back of those leaves. The lilly's edges also cut across the scene on the 'rule of thirds' which is nice, too. Yes you're so right about the striations and the stamen. Some Cala lillies have poor straom a now destroyed patch of Calla lilies in front of an apartment my son rented several years back. By the time I had enough nerve to steal some tumors, they's all been destroyed! I'm searching for varieties like that to plant in my own garden! I will study your crop suggestions. All your feedback is so appreciated! 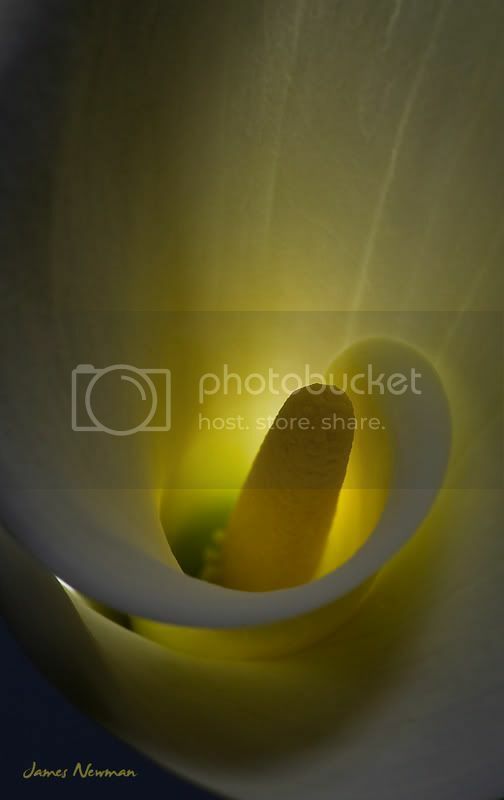 With an image such as the Calla Lily, I find there are probably several ways to crop it. Although I like Paul's way, I would have cropped it differently. To each his own, I guess! Seems about right, but I didn't measure. I usually frame in-camera so unless something just doesn't work that I can't remove, or I specifically want a very tall or very wide frame, then I don't crop. If I do crop, I crop to what I think fits the image's balance best and not worry about standard sizes. If they get framed, the framer will cut the mat to the proper size. In memorium for ravaged Cala Lilly Plants! My gardener trampled all over out Cala Lilly bed and removed most as weeds! So I have protected some stragglers and discovered more on my tour of UCLA. Asher Kelman: Lilly by the wall! I designed a pair of tall windows on the south wall of our home to get light into the kitchen and light up flowers in the mornings! Asher Kelman: Lilies Kitchen window! This looks like my Cala Lilly bloat have before the gardener's crew "cleaned up"! Thanks for restoring beauty! Wow, growing in the wild? I thought they were all cultivars.. I'm amazed.. incredible! Might be a history to that. Could be that someone planted one and this is 10 years later!